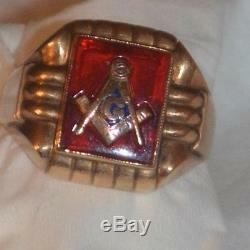 Vintage 1950's Masonic Symbol Inlaid into a Ruby 10k Solid Yellow Gold Men's Ring. Masonic Symbol is INLAID into the Ruby and Not Simply Applied to the Top. 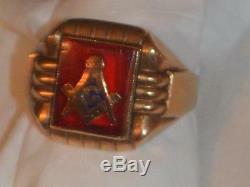 Up for sale is a Vintage 1950's Masonic Symbol Inlaid into a Ruby 10k Solid Yellow Gold Men's Ring in EXCEPTIONAL CONDITION. This Original Vintage 1950's 10k Solid Yellow Gold Ring is set with a Fantastic 14 x12mm Lab Grown Ruby inlaid with a Solid Gold Masonic Square & Compass. This Solid Gold Masonic Square & Compass is beautifully detailed down to the tiny hatch marks on the L-Square and the Screw Head at the top. This is a Very High Quality Ruby that has beautiful BRIGHT RED color and near perfect clarity. A Lab Grown Ruby has the exact same physical, optical, and chemical properties of a Natural Ruby meaning it is as hard and scratch resistant. The Masonic Compass & Square Symbol is recessed or inlaid perfectly flush into the Ruby and not simply applied to the top. This Ruby is a Cushion Shaped Cabochon Cut that is lower profile in the setting. Cabochon refers to a gemstone that has been shaped and highly polished instead of being faceted. This ruby is held securely by a complete bezel setting. This classic ring is polished to a mirror finish and has a sleek modernist look and feel. The shadows in the photos on the gold ring are not dents or blemishes. The curved highly reflective surface of the ring is difficult to photograph. This ring is in EXCEPTIONAL CONDITION and will arrive ready to wear. 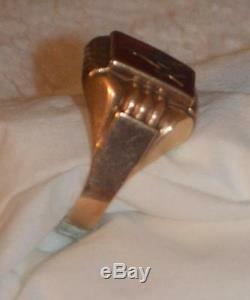 This is an Original Vintage 1950's Men's Masonic ring not a copy or reproduction. 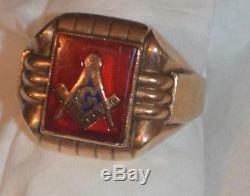 Gemstone: Fantastic 14 x12mm Lab Grown Ruby inlaid with a Solid Gold Masonic Square & Compass detailed in blue enamel. This Very High Quality Ruby has beautiful BRIGHT RED color and near perfect clarity. This Ruby is a Cushion Shaped Cabochon Cut that is lower profile in the setting protecting it from damage. Aside from some tiny edge abrasions this ruby is otherwise in EXCEPTIONAL CONDITION free of any chips, nicks, cracks, some minor scratches. Ring Size & Measurements: This ring is a size 9 and can be sized up or down by any competent jeweler. Gold: This purity mark is guaranteed to be 10k solid gold. (Again this ring is guaranteed to be Solid Gold not plated or layered). The item "Vintage 1950's Masonic Symbol Inlaid Flush into a Ruby 10k Solid Gold Men's Ring" is in sale since Sunday, November 15, 2015. This item is in the category "Collectibles\Historical Memorabilia\Fraternal Organizations\Masonic, Freemasonry\Rings & Watches". The seller is "eksmart" and is located in Davis Junction, Illinois.